Brookwood Specialty Care Neurology staff, from left, Brittany Brown, CRNP; Jitendra Sharma, MD; Michelle Emmons, CRNP; and Sheryl Smith, Neuro Administrator. Migraine headaches affect 10 percent of the world's population and are most common in women. This neurological disease can be extremely debilitating with intense pain, nausea and vomiting, and increased sensitivity to light or noise. The headaches can be triggered by stress, hormones, bright or flashing lights or diet. 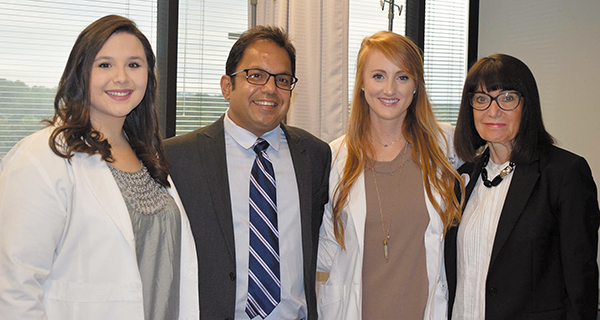 "If you have ever experienced a migraine, you know it is more than just a headache," says Jitendra Sharma, MD an interventional neurologist at Brookwood Baptist Hospital. "Fortunately, many new treatments are entering the market to help prevent or reduce the severity of migraines." In May, the Food and Drug Administration approved the first preventive migraine treatment for adults called Aimovig. This monthly self-injection is a new class of drug that blocks the activity of a molecule involved in migraine attacks. The molecule, calcitonin gene-related peptide (CGRP), plays an important role in migraines. Levels of CGRP go up during migraines, production of CGRP triggers migraines, and blocking CGRP relieves migraines. Aimovig was the first to be FDA-approved in this new class of drugs that work by blocking the activity of CGRP. Other injection therapies also provide relief from migraines. Botox injections around the neck and head can dull future headache symptoms. Toradol, a non-steroidal anti-inflammatory drug injection and Dexamethasone, a corticosteroid injection, also are effective for treating migraines. In addition to these treatments, many migraine sufferers are finding relief with intravenous (IV) headache therapy which combines a variety of medications that provide acute treatment for headache pain. The IV therapy is targeted to decrease pain and to reverse or stop the progression of a migraine that has already started. When used as a preventive treatment, it can reduce the frequency and severity of migraines. Patients can receive IV therapy at Brookwood Baptist Hospital's new infusion suite. "In the past, we had to send migraine patients to the emergency room, a hospital or a cancer center to receive infusions which was inconvenient and time-consuming for them. Now, with our own infusion suite, we can give them an infusion right away," Sharma says. "So our patients don't have to wait in line at the ER or feel uneasy about receiving treatment outside of their clinic." While the suite is used most for migraine treatment, it also can be used for the treatment of other neurological illnesses. "We can treat myasthenia gravis with intravenous immunoglobulin and many other neurological diseases that require IV infusion," Sharma says. For the migraine infusions, the medicines used include Depakote, a seizure medicine which calms the nerves; magnesium to stabilize nerves and membranes; steroids to help inflammation; pain and nausea medication; and saline. "Sometimes dehydration itself can cause chronic or migraine headaches," Sharma says. "Just by hydrating these patients for three days often helps them to come out of daily chronic headaches." Most patients see fast relief through the blend of medications designed to treat pain, nausea and inflammation simultaneously. Sharma says the biggest benefit of the IV therapy is faster recoveries. "Headache infusion shows 50 percent improvement right away, and within two to four weeks we see 80 percent improvement. When we repeat these infusions every six weeks for three months, we see 80 to 100 percent improvement in the headaches," he says. "After receiving the infusions, patients say their older medications work better and they can control headaches better. There is no doubt that use of the infusion suite empowers these patients in terms of living a good quality of life."